every fall it will need to be aerated and reseeded. Here in the Lake Norman area, it is considered the transition zone for turf. Which simply means, cool season and warm season grass will grow making it extremely difficult for us to maintain one type in your lawn. In our area, the soils are mostly clay which gets compacted very easily. Compacted soils reduce root development, decrease oxygen, and weaken the turf. 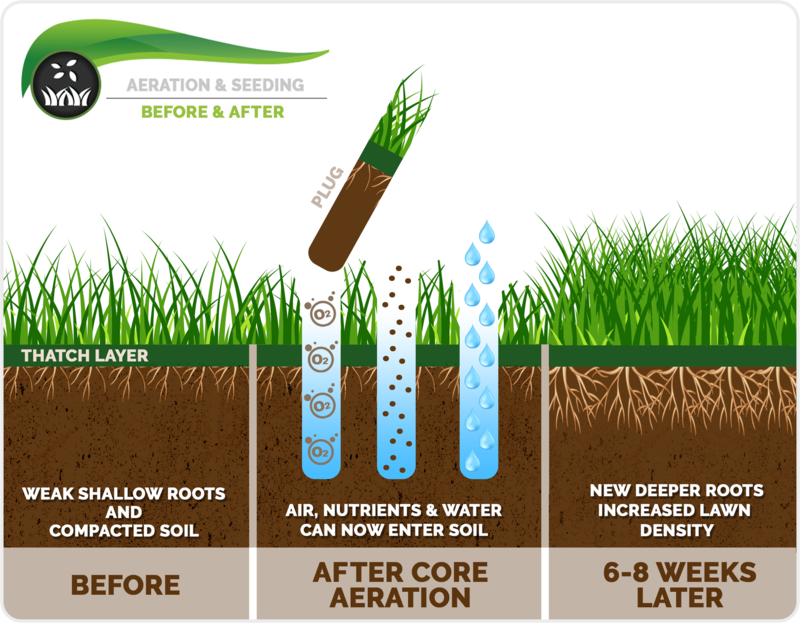 By core aerating the soil, we loosen up compacted soil allowing nutrients and oxygen to enter the soil enhancing the health of the turf. This is typically done in early fall, during peak growing season. 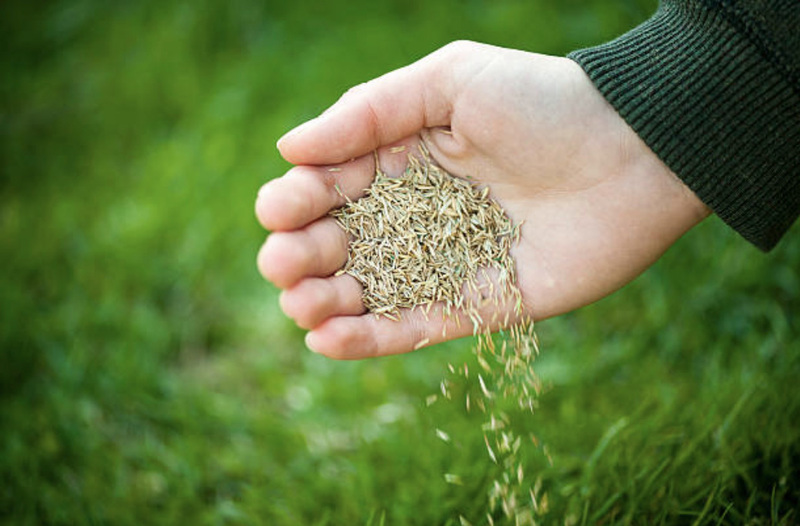 Overseeding fills in and repairs small bare areas to help thicken turf and improve the lawn’s overall appearance. If you have a tall fescue lawn, every fall it will need to be aerated and reseeded. 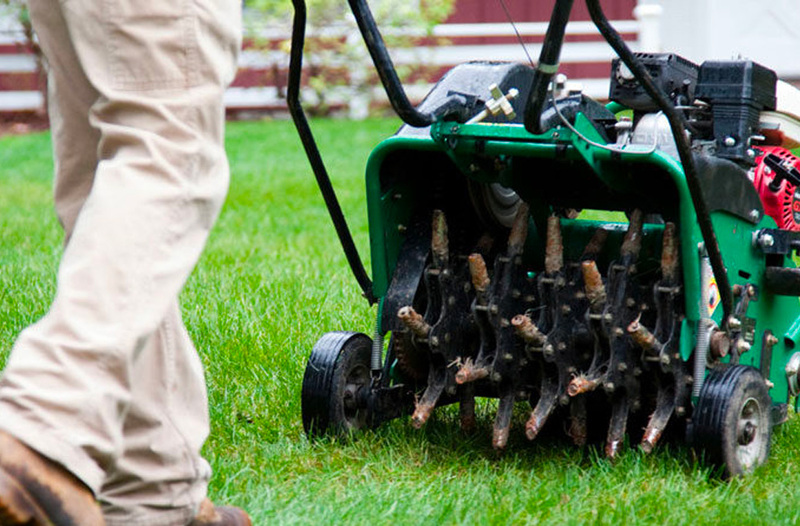 Can I mow my lawn right after you aerate and overseed? Yes, you can. The seed is not going anywhere but down. However, we suggest that the lawn is mowed short before we arrive and blown out any debris or grass clippings so that the seed can touch the soil. Will you flag my sprinkler heads? Yes, if your controller is located on the outside of the house, we will locate your sprinkler heads. If the controller is located on the inside of the home, we do not have access and you will need to flag the sprinkler heads prior to your schedule date. I have a underground dog fence, will you cut the wire? We need to know ahead of time that you have a underground dog fence. An under ground dog fence must be located by the company that installed the system prior to aeration and overseeding. If the wire is correctly located, we will cut the wire. How much should I water my lawn after you seed? Since every irrigation system is different, we want you to check it daily to make sure the seed is only moist. There should be no puddling or dry areas. It’s you start to see puddling or it is too wet to walk on, turn back the irrigation. If the seed is dry, turn up the irrigation. You should water for 10-14 days after seeding for the seed too germinate. It is critical to check daily for optimum results. How long should I wait until I can mow my lawn? You should wait about 3 weeks to mow your lawn after aeration and overseeding. Make sure the irrigation is turned back to prevent your lawn mower from causing damage. Make sure blades are also sharp to not tear the new tender grass. A huge storm came through after the service was performed, now what? Please give us a call to schedule a touch up service. We cannot warranty acts of god but we can repair the areas that do not germinate due to wash out. It will be a minor cost compared to your full aeration and overseeding service. All my seed germinated and then it all died. What happened? All depending on the weather and temperatures, disease can set in and kill young seedings within a few days. If night time temperatures are above average, contact us to inquire about an additional fungicide application. Some spots did not germinate. Will you be back to fix? If you have some areas that are still thin, please send in some photos and we can schedule a touch up service for an additional cost. My lighting does not work after the aeration and overseeding service was preformed. Will you fix it?